To Cite: Zabihiyeganeh M, Chehrehgosha H, Mirzaei A. Undiagnosed Ochronosis Presented as Severe Osteoarthritis With Concomitant Osteoporotic Fracture, Shafa Ortho J. 2016 ; 3(2):e4717. doi: 10.17795/soj-4717. Introduction: Ochronosis is a rare autosomal recessive disorder of tyrosine metabolism, leading to deposition of elevated levels of homogentisic acid in different parts of the body, especially in fibrous and cartilaginous tissues. The current study presents a case with delayed diagnosis and osteoporotic fracture in addition to severe osteoarthritis and calcification. Case Presentation: A 56-year-old female with low back pain and painful knees and hips referred to the center. Right hip arthroplasty was performed to manage her severe osteoarthritis. Although characteristic features of ochronosis such as urine darkening, subcutaneous pigmentation and degenerative ochronotic arthropathy resembling osteoarthritis were observed in this patient, surprisingly it remained unrecognized until the 5th decade. Bone mineral density showed that osteoporosis and zoledronic acid had started. Conclusions: Usually, osteoarthritis is inversely correlated with the osteoporosis. Considering ochronosis as an osteoarthritis predisposing factor, the osteoporosis manifestation is not expected in such patients. However, in the current case, simultaneous osteoarthritis and osteoporosis fracture was observed, indicating unreliability of bone mineral density (BMD) in such patients. Authors believe that ochronosis could reduce bone quality, while its quantity might increase. Alkaptonuria (AKU) is a rare autosomal recessive disorder of the tyrosine metabolism caused by homogentisic acid oxidase deficiency (1). It results in a multisystem disorder called ochronosis. 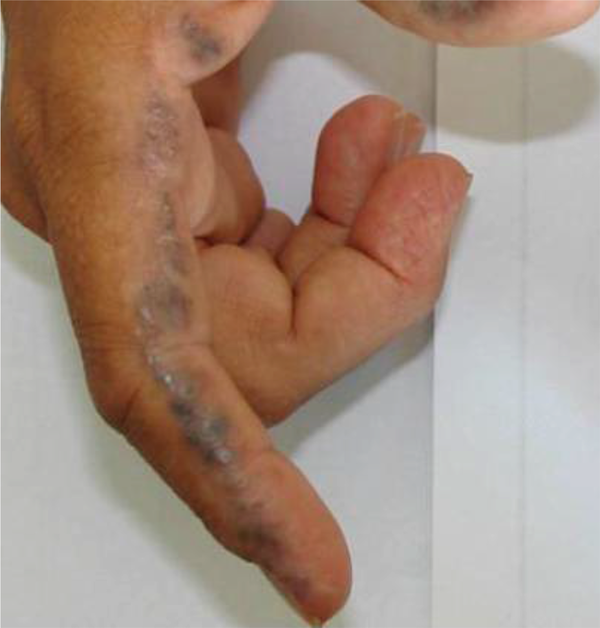 This defect is associated with the deposition of homogentisic acid in connective tissues throughout the body identified as ochronosis. Diagnosis is confirmed by quantitative measurement of homogentisic acid in urine. These patients are usually asymptomatic in childhood, however during the third decade, deposition of the pigments are noticeable in the ear cartilage, sclera, large joints and lumbosacral region. Calcification of intervertebral discs is a characteristic found in the radiographic evaluation of these patients. The ochronotic arthritis results in ankylosis and limitation of motion, resembling rheumatoid arthritis or osteoarthritis (2). The disorder is also characterized by dark brown or black urine when exposed to air (3). Although no effective therapy is available to treat AKU (4), monitoring disease complications including osteoarthritis (OA) is recommended. The current report aimed to present a middle aged female with generalized OA with concomitant vertebral fracture corresponding to undiagnosed ochronosis. In spite of its congenital nature, it remained undiagnosed until the 5th decade of age in this patient. In addition to its late diagnosis, the manifestation of disease with concurrent osteoporotic fracture and OA, which is a rare phenomenon, is noteworthy. Usually, OA is inversely correlated with the osteoporosis, while opposite correlation was observed in the current case. A 56-year-old female was admitted with low back pain and painful knees and hips. No history of allergies, alcohol consumption, smoking and drug addiction was reported. Approximately, three years before admission, she had progressive low back pain and morning stiffness lasting for twenty minutes which was accompanied by limitation of motion and reduced daily activity. During the four months prior to admission, her back pain became increasingly severe. Self-rated pain severity was reported 5, while 10 indicated the most severe pain. Subsequently, arthroplasty of right hip was performed in association with the pain and severe OA. After the surgery, she was not able to sleep supine. No symptoms of infectious diseases, respiratory and cardiac problems were observed following the surgery. Medications included analgesics needed for back pain. Physical examination demonstrated a significant reduction in the spinal column mobility, loss of range of motion in both knees and hips, and pigmentation of first and second fingers in both hands (Figure 1). Flexion contracture in both knees, decreased degree of lordosis and lumbar scoliosis were also detected. In the laboratory tests, complete blood count (CBC) and C-reactive protein were normal, and erythrocyte sedimentation rate was 27 mm per hour (reference range, < 10). Results of additional serological, hematological, biochemical and hormonal tests were normal. 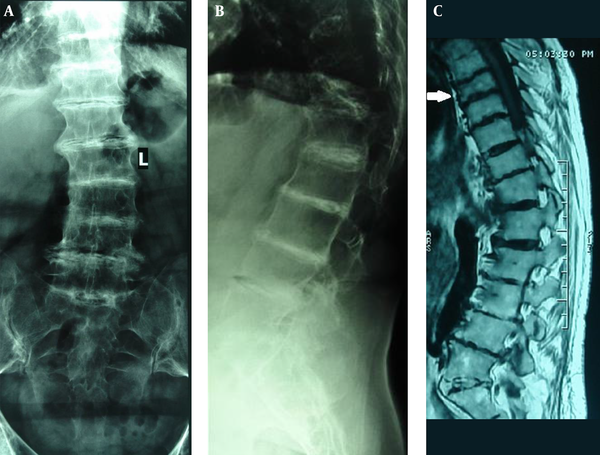 Radiographic examination of the thoracolumbar spine revealed severe OA, ankylosis and intervertebral disc calcification with evidence of fracture of the eighth thoracic vertebra (Figure 2). Moreover, knees X-ray showed severe decrease in the joint space of both knees. Symptoms of ochronosis as urine darkening and subcutaneous pigmentation were observed in the patient. Dual-energy X-ray absorptiometry was used to determine the bone mineral density (BMD) of the lumbar spine (LS) and femoral neck (FN) which showed average BMD of 0.808 g/cm2 with T-score of -2.2 SD in the LS, and the density of 0.660 g/cm2 with T-score of -1.7 SD in the FN. Although BMD indicated osteopenia according to world health organization (WHO) criteria, spinal vertebral fracture without history of trauma and normal laboratory tests is compatible with that of osteoporotic fracture. Therefore, treatment was initiated with intravenous infusion of 5 mg zoledronic acid. Figure 2. A and B, Anteroposterior and lateral views of lumbar spine showed calcification of intervertebral discs, fusion of vertebrae, diffuse vertebral sclerosis in lumbar spine without evidence of fracture; C, magnetic resonance imaging of thoracolumbosacral spine showed severe osteoarthritis and fracture of the eighth thoracic vertebra (arrow). Ochronosis was first reported in Lebanon and Sudan in 1958 and 1965, respectively (3). Ochronosis is usually asymptomatic in childhood and pigmentation becomes apparent during the third decade of life. In a study on 58 patients aged 4 to 80 years, alkaptonuria was diagnosed before the age of one in 21% of the cases (4). In the rest of the patients, the mean age of diagnosis was 29 years (5). Another study reported the prevalence of this disease as one in a million in 1998 (6). However, this prevalence might vary in different regions. During the literature review, five relevant articles from Iran were notified. The first one reported three cases of ochronosis after discectomy surgery in 2013 (7). The second one reported the surgery of a pathologic hip fracture in a 54-year-old female in 2009 (8). The third article presented a case of ochronosis in a 54-year- old female and recommended that alkaptonuria (AKU) should be considered in the evaluation of low back pain of patients with a positive family history and bluish discoloration of cartilage tissues (9). In addition, manifestation of alkaptonuria in cluster among the family members is reported (7). Azami et al. reported that the mean age of patients with ochronotic arthropathy was 46.1 years and recommended more perfect screening to assess the true incidence of this disorder (10). Considering previous reports, the age of diagnosis of the current case was interestingly late which was correlated with the lack of appropriate healthcare facilities in the corresponding rural region. The relationship between OA and osteoporosis (OP) is controversial in ochronosis. Although previous studies suggest that OA is associated with reduced possibility of OP (11), the risk of osteoporotic fracture does not seem to decrease in ochronosis associated OA. It could be concluded that BMD results might be unreliable in AKU patients and in spite of higher quantity of bone its quality might be adversely affected in AKU patients. Hence, these patients would not be considered a lower risk of fracture than the general population (12, 13). In this regard, Aliberti et al. suggested that ochronosis may be associated with increased bone resorption rate and bone loss. They suggested that specific mechanisms including microlesions of the matrix, viability of the osteocytes, and deterioration of the collagen network could be responsible for such observations. They showed that alendronate does not decrease the loss of bone mass in a considerable number of patients with ochronosis and osteoporosis (14). However, treatment with bisphosphonates could be useful in patients with ochronosis and osteoporosis. One-year follow-up of the teriparatide administration of ochronosis associated OA showed no new fracture in some studies (15, 16). The biggest limitation of the current study was the lack of equipped laboratory to measure homogentisic acid. However the urine oxidation test in the exposure to air was performed. In conclusion, according to the current study report severe generalized OA with concomitant osteoporotic fracture could be observed in patients with ochronosis. Technically, development of osteoporotic fracture is associated with the imbalance of bone metabolism leading to osteopenia or osteoporosis. It could be hypothesized that the homogentisic acid polymer deposition in the bone matrix and osteocytes may play a pathophysiological role in accelerating bone loss. As a result, it is suggested that in patients with severe generalized OA, metabolic bone diseases such as ochronosis could be taken into account. In addition, BMD measurements in this setting provide unreliable results and screening of fracture is strongly suggested. Authors greatly thank the patient who let them publish her pictures in this paper. Authors also wish to thank the clinical research development center of Rasoul-e-Akram Hospital especially Dr. Sheikhvatan for the technical support to implement the project. Authors’ Contribution: Study concept and design, Mozhdeh Zabihiyeganeh and Haleh Chehrehgosha; acquisition of data, Haleh Chehrehgosha; drafting the manuscript, Haleh Chehrehgosha; critical revision of the manuscript for important intellectual content and study supervision, Alireza Mirzaei and Mozhdeh Zabihiyeganeh.